I read, write and think about learning, knowledge management and collaborative work — it’s a lot to keep up with. My Personal Learning Network (PLN) and Personal Knowledge Management/Mastery (PKM) practice has become vital to my professional growth . Of all the things I do in support of these efforts — blog, write articles, read, synthesize (what PKM calls “sense-making”), share, meet, respond and react — it is Twitter that I get the most questions, doubt, and even hostility about. I want to share here why I use Twitter, and how it helps me. I begin by saying I was late to it. I was skeptical, and more than a little derisive about those tweeters constantly tethered to their phones. I did not dive in: I was hesitant, lurking, dipping my toes in one digit at time. So, to you doubters, I was there with you not long ago. Now, in two-years’ time, I can’t imagine my professional life without it! With that said, it is NOT about Twitter itself. Twitter is a tool, like a hammer or a saw — they are useless until used purposefully. Twitter will be gone in 5 (or 10?) years, replaced by something(s) else. While I have found great value in applying Twitter to develop my PLN, it needn’t have been Twitter. It just worked well for me. You might find another tool that works for you. Great! It is the practice, not the tool. Capture thoughts and notes in real time, often with a hashtag (#, as in #learning) to help categorize it for myself and others. Share and “favorite” useful tweets to let the most pertinent comments rise to the top and become easy to find. Find like-minded people across the hall, or across the globe, with whom to share and learn. I have built my PLN from scratch, relying on Twitter for 90% of it. There is generally a true spirit of generosity and openness that’s remarkable. Follow and learn from experts and leaders, to see what they are thinking, reading and see who they are following. Because Twitter is a-symmetrical (unlike Facebook, for example) you can follow anyone without the need for that person to reciprocate. (This difference was articulated nicely by Harold Jarche, which — and whom — I found via Twitter.) I follow @BarackObama, but he doesn’t follow me… yet! Twitter storms. A synchronous (live) twitter event around a particular topic, these are generally moderated in a Q/A format with some opportunity for intros and self-promotions. Twitter storms are extremely useful to share and hear ideas, “meet” new like-minded people, and enjoy some PD time. Best of all, the transcripts are available after to remember and reflect on the storm’s activity. Like Twitter storms, tweeting during — yes during! — live events, classes and sessions proves to be very useful. It creates a “back-channel” to help make sense of the information, and adds instant and long-lasting value by providing insights into what others make of it. In addition, it is a great way for me to experience an event even if I’m not there. It is so valuable! — Who cares what I think? I care what I think (or thought last week or last year). You also might. And if not, that’s fine too. It is a micro-blog tool, a way to share thoughts and activities. The value is in the stream to reflect upon later, to discover others who cared, reactions to forming ideas and activities as they grow. When you share an idea or thought, you never know how others — or even you, after some time passes — will react. I saw Dr. deGrasse-Tyson stop, mid-talk, to tweet a thought. If it is worth noting, it’s worth saving. And, if worth saving, it’s worth sharing. 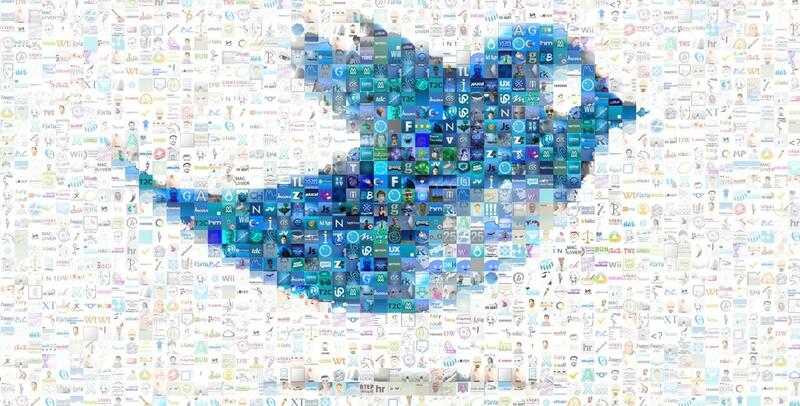 — What can you learn from 140 characters? It’s not enough! Enough for what? To jot a note? Or ask a colleague a question? Or refer your friend to an article or video you found? 140 characters is plenty. In fact, I have found over time that the space limit actually helps sharpen my writing — and thoughts — down to essentials. Remember: It is not a replacement for other forms of communication! — It’s a fad that’s going away. As I say above, it’s true: If we’re still using Twitter 10 years from now, I’ll be quite surprised. The same is also true of Facebook, email (please, let it be so!! ), and wired telephones (who has long phone conversations anymore!?). 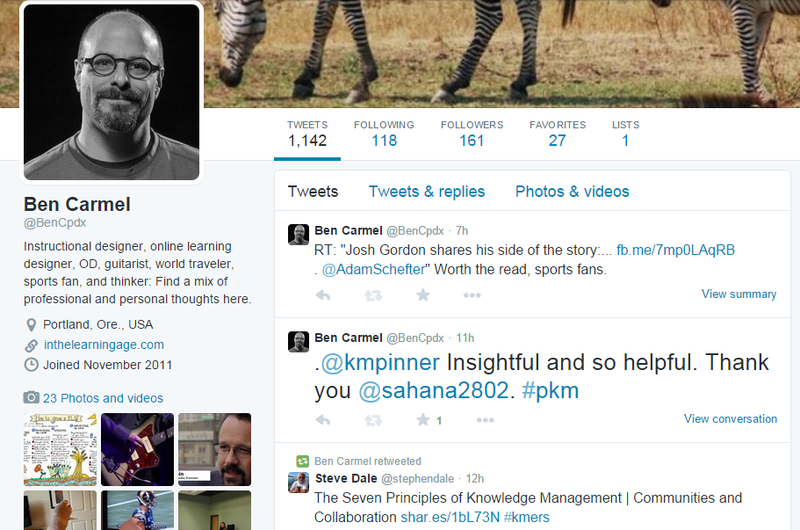 Tools come and go, but building PLN and PKM practice will remain. — It’s too informal. It’s frivolous. Depends on who’s wielding the tool. It can be feathery light or as serious as life-and-death (literally, as #BlackLivesMatter showed). –– I don’t have time. If you find it useful, you’ll have time. You don’t have time to change a tire on your car on your way to work, unless you need to change the tire. Find me @BenCpdx… I’ll leave the bird on for you. If I’m the recipient of your first tweet, it would be an honor and I promise to reply. I don’t follow that many people/organizations but I’d have to be on Twitter full-time to keep on top of everything I get. How do I manage that? Yes, Twitter is constant, relentless. I’m certainly not suggesting you keep on top of every tweet — that would take hours every day. Treat it more like a scroll at the bottom or a news channel. Spend 5 minutes a couple times a day scanning your timeline (that’s Twitter for inbox) and choose a few things that jump out at you. For those you can reply, favorite (saves them for later), retweet, follow the author, or decide to spend a few extra minutes clicking an interesting link to see what’s what. Then, maybe once a week, take 30 minutes to circle back to look more closely at your chosen messages. After a while you’ll know much more quickly who and what you find valuable. It is absolutely a practice of winnowing, while keeping an open eye for new people and ideas. In the end, it’s not about what you might miss, but what you gain.